Stříbrná mince Mír na Zemi 2013, Proof-like, 1 oz In stark contrast to Consumerism, this design celebrates Christmas for its true meaning. Small and unassuming in the centre of the round, superimposed over the star of David, is a Nativity Scene set against a stark and bare background. 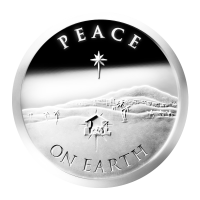 Overhead is the star of David and the word "Peace" and below the words "On Earth" bring to mind the words of the angel to the simple shepherds. In the distance can be seen the Three Wise Men on their camels. The reverse features the standard Silver Bullet Silver Shield crest and message.